They also sang along to Neil Diamond's Sweet Caroline. The flamboyant rappers – Quavo, Takeoff and Offset – are known for their ostentatious dress sense and high volume of jewellery. While being driven around Los Angeles for the popular segment of Corden’s The Late Late Show, Migos stunned the British TV presenter by counting out 200,000 US dollars (£154,000) in cash stashed in one of their bags. A stunned Corden said: “I have never in my life seen that much cash.” Migos later took the chat show host clothes shopping at a designer store. After spending time in the dressing room, Corden – who had been wearing a navy blue polo shirt – emerged wearing a silver jacket with matching sunglasses before imitating some of Migos’ signature dance moves. 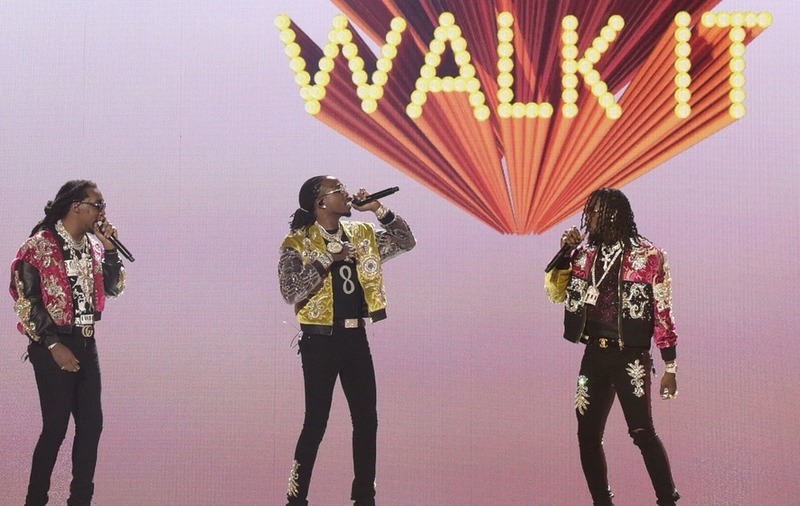 The segment had opened with Corden and Migos rapping along to the group’s hit Walk It, Talk It, before they discussed the viral dance move the dab, which they created. Popularised by Premier League footballers including Paul Pogba and Jesse Lingard, it has become one of the most popular dance crazes in the world. The conversation then moved on to Migos hits, which include Bad and Boujee, Motorsport and Stir Fry. Corden joked he was going to “make love” while listening to Bad and Boujee, adding “normally, me and my wife just have the Les Miserable soundtrack”. The segment finished with Migos singing along to Neil Diamond’s 1969 hit Sweet Caroline. Guests have included Sir Paul McCartney, Ariana Grande and Adele.